While we’re waiting patiently for the release of the Cricut Maker, we thought it was worth introducing another new product — the Cricut BrightPad. It’s not a new superstar cutter, but it is a tool that promises to make your cutting experience more fun, efficient and professional than ever before. The BrightPad came out in June 2017 and we’ve been playing it with it for the last month or so — here we’ve compiled our thought and Cricut BrightPad review so you can see if it’s worth buying for yourself. 1 What is the Cricut BrightPad? First things first, let’s actually define what this tool is. When we first bought it, we were a little confused. It looks like a tablet… that lights up… that we can do weeding on? Well, all of those three things are technically correct, but of course there’s plenty more to it than that! 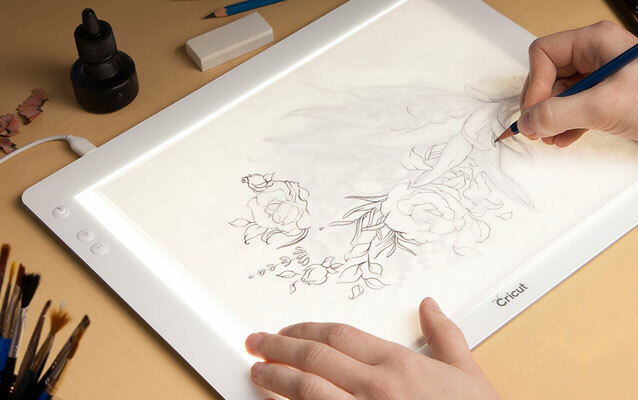 Essentially, it’s a lightbox, specifically designed for crafters. …an illuminated workspace that helps you see the all the details of even your most intricate arts and crafts projects, from tracing to weeding vinyl and iron-on, from paper piecing quilt blocks to even model building and jewelry making! Just like we imagine most of our readers, we’ve used it almost entirely for weeding and tracing — and we have to say that we don’t know what we’d do without it now. It’s one of those tools that you don’t really know that you need until you actually use it, and then it becomes totally indispensable! Here’s everything you need to know about the BrightPad before you buy. What makes this tool so good for weeding and tracing is the powerful LED light that can shine through your material, highlighting cuts and showing where you need to work. If you’ve ever squinted over a tracing, or attempted to weed late at night, you’ll love this feature. What makes it even better is that Cricut know that no two pairs of eyes are the same — that’s why there’s 5 brightness settings. You can adjust the brightness level to exactly what you need according to how your eyes feel and your lighting circumstances. Need just a little extra light as you do some tracing out in the yard on a sunny day? No problem — put it on a lower setting. Weeding late at night without any natural light? Crank up the brightness! 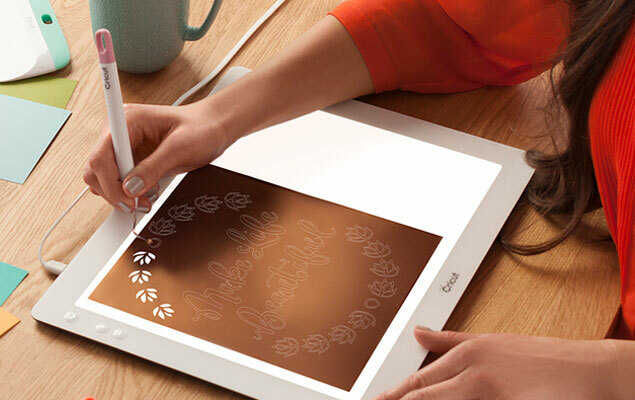 We’ve tested out the Cricut BrightPad on almost every surface conceivable and found that it stays in place and stable wherever you are — unlike when you’re using your iPad or other tablet! Whether you using it on a desk or table, on your knees while you’re on the sofa, up against an easel or wherever — you’ll find that it stays in place. While the BrightPad certainly resembles a tablet, we know that you’re not going to want to take an X-ACTO knife to your iPad any time soon! Thankfully, scratches aren’t a problem as Cricut has made the poly-carbonate surface of the BrightPad a 6H on the hardness scale. The higher the number that a surface registers on the hardness scale, the more scratch resistant it is. Cricut say that most other light boxes on the market only reach around 3.5H on the scale, so the BrightPad is measurably more durable — and much better suited to cutting crafters. One of our major concerns about the Cricut BrightPad before we bought it was that it would be too bulky and sturdy to be of much use. We’ve used light boxes occasionally in the past, and although we can see their benefit, they’ve inevitably frustrated us by being too deep to use properly on a desk and too heavy to hold in our hands against our knees. Not so the BrightPad — it’s incredibly lightweight and, as we’ve said multiple times already, thin enough to resemble a high-tech tablet. Just 0.35 inches deep, in fact. If you’re using it on a desk, it’s barely deep enough to rise much above the desk surface. You definitely don’t need to prop your elbows up or alter your posture. Similarly, it’s light enough to hold in your hands and prop against your body if you’re using it away from the desk. No wrist ache with the BrightPad! The dimensions of the tool are 13.375″ x 10.875″ x 0.35″. The size of the lit area, however is 9″ x 11.5″. Considering the maximum cut size of the Cricut Explore Air 2 is 11.5″ x 23.5″, that means you will need to do some readjusting of your material on the surface if you’ve cut to the maximum size. We don’t mind this, however: the BrightPad is small and light enough to be able to maneuver material around it easily. Plus, it would be much more cumbersome and hard to use if it measured the full 12″ x 24″! It’s also super lightweight at around 1.75 lbs. Let’s just put this out there — a product can be beautifully designed and work fantastically, but be entirely useless if you’re never going to use it. This is definitely not an issue with the Cricut BrightPad. As we mentioned in the introduction, it’s become an indispensable piece of kit to us, and we think will prove invaluable to all you cutting crafters out there. We’ll go into everything that makes it so good in a second, but the number one thing you should be aware of is just how much easier it makes routine, tedious jobs like tracing and weeding. The bright is light and immediately illuminates your cut lines — ideal for weeding. We’ve given ourselves eye strain before by slaving for hours over an intricate project, only to completely lose our minds when we tear the material from careless weeding. Plus, it makes tracing images so much easier — as you’d expect from any light box worth its salt. Unlike some of our favorite cutting machines, there’s no learning curve to master with the Cricut BrightPad, let alone any needlessly complicated software. You simply plug it in and use it. Wherever you want. Thanks to a clever design, it’s perfectly slim and lightweight so is easy to both hold in your hand and simply use on a desk. The non-slip bottom helps to keep everything in place too. Even the most arthritic hands shouldn’t have too much trouble with it! There’s a power button on the left hand side of the lit area, together with easy to navigate + and – buttons to adjust the brightness settings. The light itself is bright and uniform, perfectly designed to illuminate fine cut lines. Easy peasy. So easy to use, in fact, that we didn’t even open the welcome booklet that comes with it. Yes, we know, we’ve only had it for about a month — impossible to really estimate its durability. But it certainly feels sturdy, and the scratch resistant poly carbonate surface is truly something to behold. We’ve been working our X-ACTO knife on it plenty and it still looks clean and good as new. If you’re not using the BrightPad for weeding, then you’re probably not getting the full benefit from it. The majority of the work we’ve used the Cricut BrightPad for so far has been vinyl cutting related. Tracing images for use in Illustrator and weeding out our vinyl cuts, in particular. We’ve also experimented with it on other craft projects — piecing together quilt pieces and even doing intricate jewelry making work. Essentially, any craft where you can benefit from an adjustable light source is going to be well suited for use with the BrightPad. If you’re one of those crazy crafters that likes to use your cutting machine when you travel (disclaimer: this is totally us), then you’ll love how portable the BrightPad is. Slim and lightweight, you’ll be able to slip it into any handbag or carry-on baggage. We’ve actually taken to storing it within our Cricut tote bag, in order to keep all our cutting materials together. We know you should never judge a book by its cover, but everyone knows that crafters love a good aesthetic! We’ve got the mint color (love that it matches with the Explore Air 2!) but it’s also available in blue, lilac and rose. One big minus point for the BrightPad is that it can only be used when plugged into power, using the 6 foot USB power cord. While we didn’t find that this was an issue when using it at a desk or table, it’s a little annoying to be dragging a huge cable around with you when you’re sat on the sofa or travelling. It’s safe to say that the light is powerful and even, which is guaranteed by being plugged into a power source, but we wouldn’t have minded paying a little extra for a powerful rechargeable battery like you get with a tablet. We’ve found that it illuminates the majority of materials really well, but we recently put it to the ultimate test: glitter HTV. This thickly, opaque material proved a little too much for it, however: the BrightPad made very little difference at illuminating the fine cut lines, even on the brightest light setting. This is disappointing, although we think it should only be a deal breaker if you spend the majority of your crafting time working with glitter HTV vinyl. We found it very useful on everything else we tested. Overall, we would highly recommend the Cricut BrightPad and would now include it as an indispensable part of our vinyl cutting kit. It’s useful, lightweight, durable and easy to use — although we’d suggest skipping it if you only work with glitter HTV. Are you tempted to try the Cricut BrightPad? Note you do not have to Plug it into a wall outlet can be plugged into a USB port of your computer or a portable charger. It is really nice to use, except for opaque vinyl. I just cut a bright cherry red piece of outdoor shiny vinyl. It is a very intricate. I cannot see the negative (or positive) spaces to weed. I may just cut another piece of something else. This was a big disappointment for me. I look forward to weeding! This will be a chore, so maybe this device isn’t made for me.